Some estimates reveal that Americans waste as much as 60 million tons of food a year. Given the plight of world hunger, this fact is shameful enough, but what many of us may not realize is that wasted food also has a harmful effect on the environment. So that we might be better stewards of the earth we have been given, here are five biggest ways wasted food hurts the environment: it wastes water; it releases methane; it wastes oil; it wastes land; it harms biodiversity. How can people combat this problem of wasting useable food? Here are five of the most common ways: use restraint; don’t be afraid to disobey the “sell by” date; really use leftovers; don’t forget scraps; do your research. 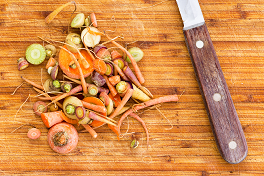 Food waste is a real problem, and it doesn’t have to be. While the loss of food due to poor harvesting or other methods in developing countries is its own issue, the millions of tons of wasted food in our nation often, though not always, lie with the consumer. Creative, careful, and thoughtful shopping, cooking, and consumption will go a long way to responsibly using the food we have and can even make a path to fullness for the millions of people worldwide who are hungry.